Shoebomb plotter Saajid Badat has been sentenced to 13 years in jail for planning to blow up a passenger plane. The 26-year-old, a religious teacher from Gloucester, was sentenced after he admitted conspiring with fellow Briton Richard Reid. 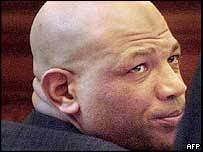 He pleaded guilty in February to the plot to blow up the transatlantic flight on its way to the US in 2001. 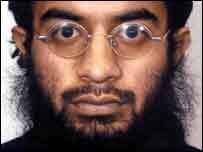 The judge at the Old Bailey said Badat could have been jailed for 50 years if he had not withdrawn from the plot. The case is the first successful major terrorism prosecution in the UK since the 11 September attacks on the US. The court was told how Badat had an identical device to the one Reid had tried to use on a flight from Paris to Miami in December 2001. Reid and Badat were also linked to Nizar Trabelsi, a Tunisian who is now in jail in Belgium for terrorism offences. Both men had used Belgian telephone cards to contact Trabelsi, a former professional football player who admitted planning to drive a car bomb into the canteen of a Belgian air base. Badat had bought a ticket to fly from Manchester to Amsterdam on 17 December 2001, and then on to the United States. But he did not take the flight. An e-mail from Badat to his family on 14 December 2001 indicated he intended to withdraw from the plot. Unlike Reid - who was jailed for life in the US after he attempted to detonate his device on a flight - the court was told how Badat could not face being a "courier of death". He dismantled his shoebomb, which was specially designed to evade airport security, rejected terrorism and became a religious teacher. Michael Mansfield, QC for Badat, said his client's faith had brought him "to the very brink of disaster", but it was the same faith that had pulled him back. Mr Mansfield said Badat wanted to send a message out that what he had almost done was wrong. "He wants it known that there could never be any justification, religious or otherwise, for sacrificing the lives of innocent men, women and children," said Mr Mansfield. Judge Adrian Fulford said Badat had been part of a "wicked and inhuman" plot, but accepted he had had a "genuine change of heart". "Turning away from crime in circumstances such as these constitutes a powerful mitigating factor," the judge added.